I don't know what exactly is the cause, but in TR you can take into account that they are trying to achieve a higher level of detail than Morrowind. This specifically means that they will use more objects in a single cell than any Morrowind cell has and it will be more demanding on your machine as a consequence. Could the camera's zoom be tweaked so the distant terrain looks a bit farther away, by maybe 25% to 35%? 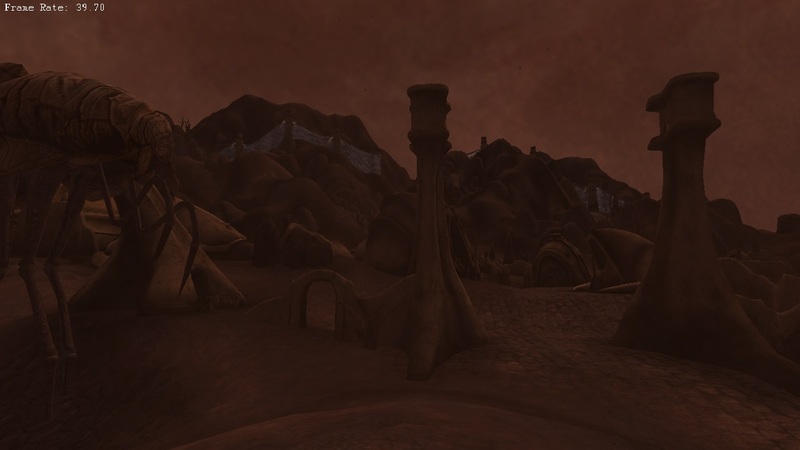 In the first image, Red Mountain looks a bit too close to Ald'ruhn to me, and I feel it's because the camera settings are based on vanilla Morrowind which wasn't designed for distant terrain. You could adjust your FOV slider to create the illusion that objects are more distant. You're right, but I was thinking of zoom separate from FOV, I know from MGE XE's Auto FOV function that there's an optimal FOV for the screen resolution, and increasing FOV wider than that could cause distortion in the corners of the screen. Hi, forgive me as I'm a complete noob to OpenMW (I've been holding off until Distant Terrain was ready). You say to add some lines to settings.cfg, but I can only find settings-default.cfg. I have run the game through the OpenMW launcher, and changed a few settings, so I'd assume a settings.cfg would have been generated. Am I missing something? Yes. Settings-default is not used as your settings. You need to find settings.cfg. For me it's in C:\Users\Veiko\Documents\My Games\OpenMW (I'm on windows). If all else fails, I would do a search to find it. Ah, yes, I completely forgot about the "My Games" folder, I was looking in my "Games" folder in Documents (my fault for naming it that). nerevar009 wrote: Could the camera's zoom be tweaked so the distant terrain looks a bit farther away, by maybe 25% to 35%? In the first image, Red Mountain looks a bit too close to Ald'ruhn to me, and I feel it's because the camera settings are based on vanilla Morrowind which wasn't designed for distant terrain. The game world is much smaller than it feels when you have a short view distance. With distant terrain, you have a huge central point of reference to judge distance by, like white gold tower in Cyrodil, which is a big part of why Oblivion felt smaller than Morrowind (imo) despite the game world being a good bit larger. You can mess with FOV, since too-narrow FOV is basically the same as zooming, but that may not be enough. A distance haze shader might also help give the illusion of greater distance. There's not really a way literally just zoom distant stuff without either zooming everything or having weird effects up close, like some kind of telephoto lens.